Stephen King has been one of my favorites for a while now and much as I love his newer books, I like to return to his older works every now and then. Sometimes it can be disappointing ("Desperation" , "Needful Things") but in most cases it's an interesting journey. What I see as one of King's greatest strengths as a writer is the ability to accurately portray extreme emotions. He uses various means for that, often choosing unusual imagery. 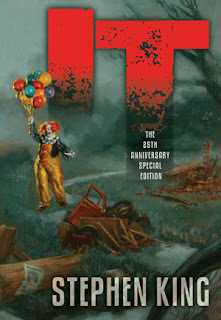 In "It" the protagonists confront evil which often takes physical forms of their greatest fears, such as great bird, evil clown or abusive father. The image of clown is particularly striking. 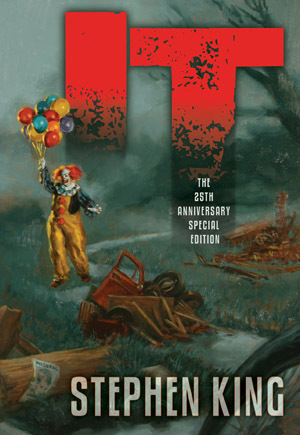 What I really liked about "It" was how two different stories set apart in time by years. During most of the book we follow the story of a group of children who are described as "Losers". They form a group, set up a club and eventually discover that each of them has seen something unusual or scary and that no one else seems to be noticing these "things". In the end they face the evil and manage to defeat and banish it. 27 years later the children begin disappearing again in the town of Derry and the same group meets again, this time to destroy the evil completely. What makes it harder for then is that they are all suffering from some kind of amnesia and seem to have pushed the memories of their childhood away from their minds. So in order to defeat It, they must first remember what had actually happened when they were children. The way in which these two stories are interwoven makes following the plot an interesting experience. Another strength of the book is the use of two different ways of perceiving reality - that of children and adults.While the first one may seem to be more naive and superficial, it also has certain merits that become essential in fight against It. I also liked the way Derry was presented. The whole town was shown both as a place and a symbol in itself. A kind of organic being, deeply corrupted and evil. The same mechanism was used in some of King's other works (such as "Salem's Lot") but here it seemed more convincing.